On Sunday, the rabbi moved to Florida's Panhandle. On Wednesday, Hurricane Michael hit. Hurricane Michael hits land in Panama City, Fla. When he and his wife moved to Pensacola, Florida, on Sunday afternoon, Rabbi Mendel Danow expected to spend the following couple of weeks settling in and buying supplies for their new home. Instead, two days after getting off the plane, Danow found himself driving to a Walmart in Alabama to buy five 40-packs of water bottles. By Wednesday, the windows and doors of his new home were being covered by metal plates provided by their landlord. And instead of spending their first week in Pensacola alone in their new and mostly empty house, Rabbi Danow and his wife, Nechama, cooked up a stockpile of rice and pasta -- and prepared to host 10 overnight guests. 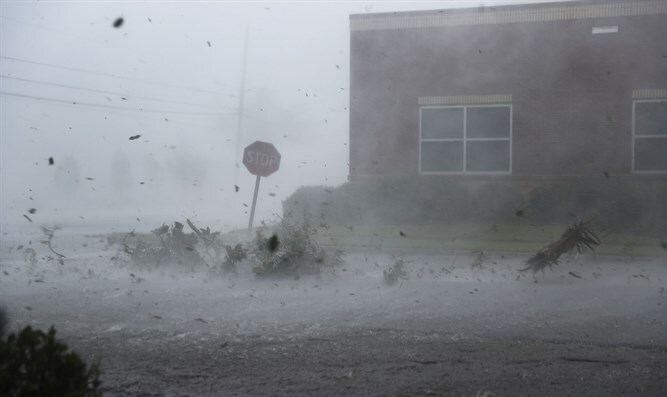 Hurricane Michael made landfall on Wednesday near Mexico Beach, Florida, roughly 100 miles west of the state capital of Tallahassee, and about 120 miles east of Pensacola, which is on the Alabama border. Maximum wind speeds topped 155 miles per hour. The storm is being called the worst the area has seen in a century. In Tallahassee, which is further inland, Jewish leaders sounded relatively calm. Both the Reform and Conservative congregations secured their Torah scrolls, but both expect to be open this weekend for Shabbat services. The Reform congregation, Temple Israel, is set to celebrate a bar mitzvah -- of a boy named Michael. "I want to make sure the other areas of the southeastern part of the country that are on the coast have not suffered too badly, and that there has been no damage to human life," she said. "I feel very lucky right now that I am inland." Besides providing for their own needs, the Danows have checked in with local Jews they have already met, ranging from seniors to young Israeli singles. Another Chabad family that evacuated from the nearby coastal town of Destin will be staying at their house.